Ozhotels is a group of independently owned and non-related accommodation hotels, motels, apartments and holiday resorts located across Airlie Beach, Australia. Oz Hotels allows you to deal directly with the hotels / apartments in the Queensland Whitsundays giving you the best possible rates for these hotels, apartments and resorts. Why deal with a travel agent when you can compare and book your Airlie Beach accommodation online directly with the hotels and save!! When you next decide to have a holiday in Airlie Beach you will quickly see that there is a wide variety of place in which to stay. 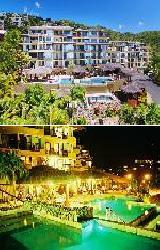 These range from fully self contained holiday apartments and resorts through to hotels and budget motels. This extensive range will make choosing the most appropriate accommodation in Airlie Beach a time consuming and difficult task and this is why so many people prefer to use the services of an accommodation expert like OzHotels to help them find the right place. Doing this you will be able to compare lots of different properties that are located right across the Whitsundays, ensuring that you get the property the meets your requirements and travel budget. The advantages of using OzHotels is that you will be able to book up to 12 months in advance and that you will get an extra discount off the already cheap rates for longer holidays. So why not book your next family escape to Airlie Beach directly with OzHotels and save yourself lots of time and money. The Martinique Whitsunday offers luxury resort accommodation in Airlie beach with spectacular sea and island views over the sparkling turquoise waters of the Coral Sea to the Whitsunday Islands. With classical French Caribbean architecture and stylishly designed, air conditioned 1, 2 and 3 bedroom apartments, villas and penthouses the Martinique Whitsundays is a unique holiday destination. 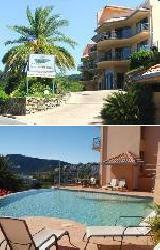 Each of these Airlie Beach accommodation apartments has large private balcony with uninterrupted ocean and island views. The resort facilities at the Martinique Whitsunday include a gymnasium, 2 refreshing spas, formal lap pool, BBQ area and tropical garden terrace. The Airlie Apartments provides individuals, couples and families with the choice of 1, 2 & 3 bedroom self contained apartments. This exceptional Airlie Beach apartments are the perfect base for your next Whitsunday holiday, where you can explore the Great Barrier Reef and Whitsunday Islands. Airlie Apartments resort is only 15 minutes from Shute Harbour, Airlie Beach and a short walk to the Abel Point Marina which is the departure point for all island and reef tours. Although this Airlie Beach accommodation is close to the shops, beach and lagoon, the hill top location means that the area is very quiet and ideal for a relaxing getaway. The town of Airlie boasts many good restaurants and nightclubs and also caters for the sports minded people with sailing, golf, tennis and lawn bowls. 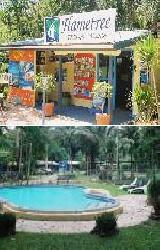 The children are well catered for with a toddlers pool and games room at the Airlie Apartments. The Blue Horizon Resort Apartments is situated only a short, flat walk to the city centre of Airlie Beach with it's many fine restaurants, cafes, shops and nightlife entertainment. With a selection of luxury 1, 2 and 3 bedroom fully self contained apartments in Airlie Beach the Blue Horizon Resort creates the perfect setting for a Whitsunday holiday. All of the accommodation apartments have been creatively designed in a Balinese inspired style with quality appliances, spacious balconies and views of the picturesque Coral Sea. When you stay at the Blue Horizon Resort Apartments in Airlie Beach you will be placed on the doorstep of the 74 Whitsunday Islands, Great Barrier Reef and a plethora of other holiday activities for guests to choose from. The helpful staff at the Blue Horizon Resort will be more than happy to help you to book any of these activities at the complimentary tour desk. 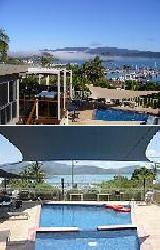 Stay in luxury and style at this very affordable Airlie Beach accommodation. 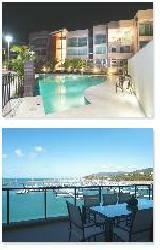 Luxury 4½ star Airlie Beach apartments is what the Azure Sea Grand Mercure Apartments provides holiday makers with. This superbly appointed, yet surprisingly affordable, Airlie Beach accommodation is the ideal place from which to explore everything that the famous Whitsundays has to offer, including the Great Barrier Reef, Whitsunday Islands and thriving local community of Airlie Beach. The Azure Sea Grand Mercure Resort has apartments fully equipped with the latest European appliances and surrounded by lush tropical gardens. The apartments also has a private balcony with spectacular 180 degree views over the Coral Sea to Hayman Island, access to the infinity edge waterfall swimming pool and are only 5 minutes walk from the main beach and Airlie Beach shopping centre. Luxury Airlie Beach accommodation does net get any more affordable than the discount rates offered for longer stays at the Azure Sea Apartments. 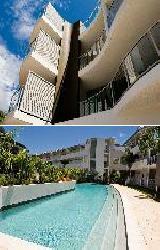 The Airlie Beach hotel is a beautiful, modern hotel offering luxury accommodation in Airlie Beach, Queensland. The Airlie Beach Hotel has the unique advantage of being located on The Esplanade, offering our hotel guests fantastic sea views, as well as on the main street of town, providing you with ease access to the many shops, cafes and restaurants in Airlie Beach. This quality hotel comprises new luxuriously appointed hotel rooms, refurbished motel style rooms and spacious self-contained hotel suites. The Airlie Beach Hotel's facilities include a swimming pool, FREE secure undercover car parking, tour desk, guest laundry and two of Airlie Beach's most popular and award winning restaurants, Mangrove Jacks Cafe Bar and Capers at the Beach Bar and Grill. 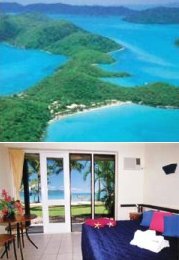 The Sea Star Apartments Airlie Beach offers a range of 1, 2 & 3 bedroom self contained serviced apartments all with breathtaking views of the Coral Sea, Hayman Island and Hook Island. Perfectly positioned to command marvellous views of the 74 island Whitsunday Islands region, yet offering complete privacy, the Sea Star Airlie Beach accommodation provides you with an irresistible tropical retreat. It also features a wide range of modern amenities and services such as direct internet access, free car parking, guest laundry, outdoor swimming pool, tour desk, bbq, airport shuttle and baby cots. Club Crocodile Resort Airlie Beach is a multi-award winning tropical resort offering affordable family and couple accommodation in a magnificent Queensland setting. 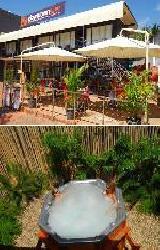 The Club Crocodile Resort is situated in the heart of the beautiful Whitsundays at Airlie Beach. When you stay at this relaxing resort your holiday will combine the variety and excitement of mainland Airlie Beach with the wonders of the Great Barrier Reef and the spectacular Whitsunday Islands. Guests at this very affordable Airlie Beach accommodation can also make the most of the resort wonderful facilities which include lagoon style swimming pools, heated spa, restaurant, room service, BBQ area, tour desk, kids play area and a tennis court. 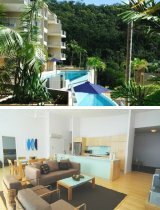 The Boathaven Spa Resort provides exceptional holiday apartments in the heart of Queensland's beautiful Whitsundays. The Boathaven Spa Apartments is located in the heart of Airlie Beach which is the gateway to 74 Whitsunday Islands and the Great Barrier Reef. Every apartment at the Boathaven Spa Resort has a private balcony with spectacular, uninterrupted views of the Coral Sea and Boathaven Bay. With beautifully appointed rooms ranging from studio apartments to spa suites and spacious penthouse apartments the Boathaven Spa Resort offers clean, affordable luxury Airlie Beach accommodation for your holiday makers, honeymoon couples, families and business stopovers. The Boathaven Spa Resort offers great value for money which makes it one of Airlie Beaches favourite Whitsunday holiday apartment destinations. 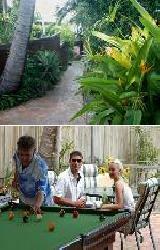 Breakfree Long Island offers truely remarkable holiday accommodation in the Whitsundays, Queensland Australia. 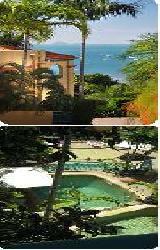 Breakfree Long Island resort is a magical island retreat located in the Great Barrier Reef Marine Park. Imagine having a holiday on a tropical island oasis - a beautiful palm-fringed beach surrounded by the sparkling blue waters of the Whitsundays, with Queensland's perfect weather. Imagine stepping out from your delightful resort accommodation to snorkel amongst the world renown tropical fish and coral of the Great Barrier Reef or to walk through magnificent rainforests before returning for a relaxing drink and swim in our pool bar. Breakfree Long Island will give you and your family a holiday experience in the Whitsundays that you will never forget. The Flametree Tourist Village in Airlie Beach gives travellers a choice of budget self contained studio apartments and cabins that are ideally nestled amongst 7 acres of shady tropical gardens. The Flametree Tourist Village Airlie Beach Holiday Apartments is positioned only 5 minutes from the Airlie Beach city centre, next to Conway National Park & only 4 minutes drive from Shute Harbour, which is the gateway to the Whitsunday Islands. 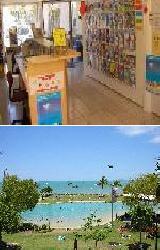 The Flametree Tourist Village provides all types of travellers with discount accommodation in Airlie Beach. It also features a wide range of modern amenities and services such as direct internet access, disabled facilities, guest laundry, pets allowed, outdoor swimming pool, photocopying services, tour desk and bbq facilities. Marina Shores provides travellers with luxury 1, 2 & 3 bedroom serviced spa apartments & penthouses overlooking the Abel Point Marina and the Whitsunday Islands. At Marina Shores in Airlie Beach also features a wide range of modern amenities and services such as business centre, child minding, conference centre, currency exchange, internet access, disabled facilities, faxing facilities, free car parking, guest laundry, lift, massage, spa, outdoor swimming pool, tour desk, bbq, massage room, garden, airport shuttle, security, 24 hour reception and baby cots. Guests staying in theis luxury Airlie Beach accommodation can explore the pristine fringing reefs off Horseshoe Bay, play a round of golf in the sea breeze, try your hand at ocean fishing, take in the full panorama of Bowen, visit Muller's Lagoon in the centre of town or just relax at this absolute oceanfront resort. 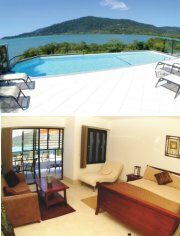 Whitsunday Vista Resort offers guests distinctive 1 Bedroom self contained apartments and Spa Suite rooms in Airlie Beach, opposite the clear waters of Boathaven Bay. Travellers can relax and have a drink on their very own private balcony with and admire the uninterrupted views of the Coral Sea and Whitsunday Islands. This affordable Airlie Beach accommodation resort is a pleasant seven minute flat stroll to Jubilee Pocket and the centre of the township with its shops, restaurants and beach. The Whitsunday Vista Resort is a great base from which to explore the surrounding area including the beautiful Whitsunday Islands, Boathaven Bay and green rainforests. 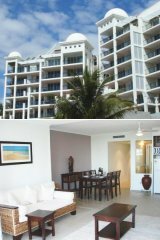 All suites and apartments feature private balconies providing picture perfect views of the beautiful Coral Sea. 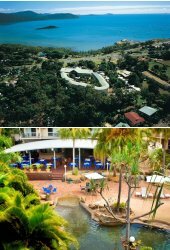 Whitsunday Vista Resort features a pool and outdoor spa, an undercover barbecue area, FREE undercover parking, restaurant, tour desk and a lift to all levels. Ideally situated in the heart of Airlie Beach, the Toscana Village is a tuscan styled resort offering elegantly appointed two and three bedroom villa apartments that feature unsurpassed views north over the turquoise waters of the Whitsunday passages to Hayman Island and beyond. This Airlie Beach accommodation comprise spacious lounge/dining area, a well equipped kitchen, private laundry facilities, two bathrooms and a private balcony with ample room for entertaining and exquisite views. The Toscana Village Resort also features four swimming pools including turbo and kiddies pool with waterfall feature, poolside BBQ area and tour booking facilities. If you are looking for affordable accommodation in the middle of Airlie Beach for the family with panoramic views and proximity to everything then the Toscana Village Resort is the place for you. The Airlie Beach Motor Lodge is the perfect holiday accommodation for the active family or couple looking for a romantic trip away. It is set apart from downtown Airlie Beach, yet within a few minutes walk is the Airlie Lagoon, beach and central village with its delightful array of shops and restaurants, making the Airlie Beach Motor Lodge the perfect haven to refresh after fun-filled days in the Whitsundays. It offers delightful motel style rooms designed for families and couples seeking long or short stay accommodation in the Whitsundays, and provides a choice of motel rooms, studio apartments and 2 bedroom self contained townhouses. The Airlie Beach Motor Lodge Resort has been totally renovated to offer guests clean, comfortable and spacious rooms with all the modern features. Guests can relax in the gazebo beside the salt water outdoor swimming pool and sauna or simply enjoy a BBQ in the tropical gardens or gazebo entertaining area. 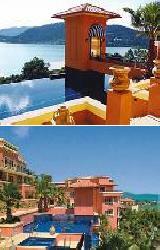 Absolute ocean front resort in Airlie beach is what the Coral Sea Resort offers. Positioned on Paradise Point in and exclusive sea side enclave this Airlie Beach accommodation provides and oasis of luxury and tranquillity, just moments via seaside boardwalk to Abel Point Marina and the enchanting, cosmopolitan Airlie Beach township. With stylishly appointed hotel suites boasting absolute ocean frontage, exceptional restaurants, comprehensive resort facilities and friendly, professional service the Coral Sea Resort is a hotel of true charm and character. 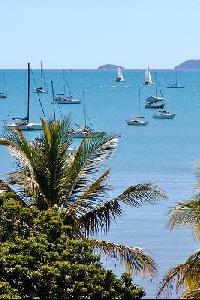 It is also the perfect mainland base for pre and post sailing holiday accommodation in the Whitsundays. Enjoying a reputation as one of the best boutique hotels in Airlie Beach and even Australia the Coral Sea Resort is the ultimate venue for a fabulous Whitsunday holiday experience. The Coral Sea Resort offers an array of hotel facilities including an award winning restaurant, cafe, 24 hour reception, security, air conditioning, cocktail lounge, fitness room, free airport transfers, business centre, water sports, 2 swimming pools, wireless internet access, free car parking, jet ski hire, ocean rafting, tour desk and a Hawaiian Fire Dinner Show every saturday evening. Combining first class facilities with award winning hospitality the Coral Sea Resort is the perfect place to stay Airlie Beach for your next magical Whitsundays holiday. The Nomads Backpacker Hostel in Airlie Beach has been recently renovated and provides holiday travellers on a budget with affordable and comfortable hostel & hotel accommodation in the heart of Airlie Beach. This budget Airlie Beach accommodation is set on 7 acres of tropical gardens and is directly opposite Airlie Beach's famous swimming lagoon. The Nomads Airlie Beach also provides travellers with the use of a wide range of modern amenities and services such as lounge bar, direct internet access, guest laundry, spa, outdoor swimming pool, tour desk, garden, poolside bar, free car parking, BBQ facilities and entertaining area, vending machines, board games, pool table, common room, Wi-fi internet throughout the property and a large fully equipped communal kitchen. The Waterfront Whitsunday offers guests travelling to Airlie Beach luxury self contained spa apartments in a fabulous location, only 200 metres from the bustling city centre of town. The 4 star accommodation resort also features large open plan apartments with private balconies complete with large corner spa baths and beautiful views across the Coral Sea, a wonderful horizon swimming pool and OnAquA, the property's gourmet restaurant offering the finest cuisine from North Queensland. Guests staying at the Waterfront Whitsunday Apartments Airlie Beach have an abundence of tourist activities within easy walking distance of the apartments including markets every Saturday, the famous Airlie Lagoon, beaches, parks, restaurants, shops and cafes. There is also access to a multitude of tours to the great Barrier Reef and Whitsunday Islands via the tour desk at the Waterfront Apartments reception. 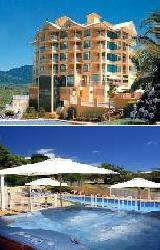 The Whitsunday Terraces Resort is ideally situated in the heart of Airlie Beach in North Queensland, Australia. Nestled on a hillside overlooking the city centre, the Whitsunday Terraces Resort offers panoramic views of the Whitsunday waters and the picturesque islands in the beautiful Coral Sea. As a reflection of the high standards of this Airlie Beach resort the Whitsunday Terraces has been the proud winner of the Whitsunday Tourism Awards for superior Airlie Beach accommodation. The Whitsunday coast and surrounding islands are a beauty to behold and the numerous islands surrounded by azure waters and coral reefs provide holiday makers and adventure seekers with a myriad of relaxing places and exciting activities which makes this the natural holiday play ground. 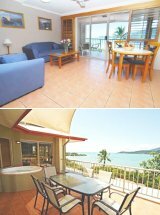 The Whitsunday on the Beach Apartments is situated Things have changed much in the Whitsundays since Captain Cook discovered it in 1770 except for the range of Whitsundays activities providing a multitude of water and land based adventures. The Whitsunday on the Beach provides convenient access to the Whitsundays beautiful islands, coral reefs and crystal clear, clean waters of the Coral Sea. At the Whitsunday On The Beach in Airlie Beach the aim is to make your stay in the Whitsundays comfortable, enjoyable and one to remember always in one of the most beautiful places in Queensland and indeed the world. Whitsunday On the Beach is centrally located in Airlie Beach within walking distance to most restaurants, shops and other entertainment. Airlie Beach is the gateway to the Whitsundays and one of the great natural wonders of the world, The Great Barrier Reef. 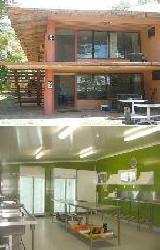 When you stay in this discount Airlie Beach accommodation you will also be able to make the most of the other activities in the area inclusing bushwalking on the great walk, a multitude of watersports, quad biking, laser skirmish as well as tours to the Great Barrier Reef and the fabulous Whitehaven Beach. If you are looking for a holiday destination that features tranquillity and comfort then the ideal place for you is the at Water's Edge Resort apartments in Airlie Beach. The rooms at the property consists of 1, 2 and 3 bedroom fully self contained holiday apartments which are quietly nestled in the hillside amongst lush tropical gardens. The at Water's Edge Resort Apartments and positioned only 100 metres from the centre of the bustling cosmopolitan village of Airlie Beach with its manmade saltwater swimming lagoon and alfresco dining restaurants where fresh seafood overflows from every dish. Staying in this quality Airlie Beach accommodation allows you to sit back, relax and enjoy the resort's recreational facilities or alternatively you can take a day trip out to the Whitsunday Islands and the pristine waters of the Great Barrier Reef. There is no better way to enjoy the magnificence of Airlie Beach and the Whitsundays that at the multi award winning luxury Airlie Waterfront Bed & Breakfast Resort. Centrally located this Airlie Beach B&B is in an exclusive sea side enclave and offering comfort and tranquillity just metres via a seaside boardwalk to Abel Point Marina and the enchanting resort village of Airlie Beach whith its namy cafes, shops, restaurants and entertainment venues. Location right on the waters edge and just a short walk to the beach, swimming lagoons, shops and restaurants the Airlie Waterfront B&B Apartments is a relaxing and quiet place to holiday. 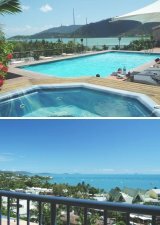 All of these Airlie Beach apartments feature panoramic views of the township and the Coral Sea, as well as being air-conditioned and furnished with antique furnishings and quality linen. This Airlie Beach accommodation resort also has facilities which include a 24 hour front desk, free guest laundry, complimentary guest storage, a spa/jacuzzi, free car parking, tour desk and Wi-fi internet access. Peninsula Airlie Beach is a brand new holiday destination that comprises luxuriously appointed penthouses and fully corporate self contained apartments in Airlie Beach. This luxury Airlie Beach property juts out into Abel Point Marina, which means that it is absolutely waterfront and provides expansive views over the marina and the Coral Sea to the beautiful Whitsunday Islands. Holiday makers at the Peninsula Airlie Beach can choice from a selection of 1, 2, 3 or 4 bedroom apartments which are all fully air conditioned and feature large balconies, lift access, security entry, free basement car parking and private internal laundry. The main street of Airlie Beach with its many restaurants, bars and tourist shops is just a few minutes away from the luxury Airlie Beach accommodation at the Peninsular Apartments. The Downtown Airlie Motel is perfectly positioned in the heart of Airlie Beach which is the mainland harbour town of the beautiful Whitsundays. Holiday makers and tourists to this beautiful Queensland holiday destination can enjoy the nearby cafes, restaurants, bars and nightlife entertainment which cater to all types and budgets. 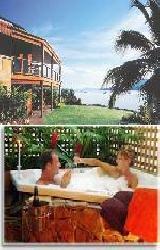 This discount Airlie Beach accommodation is conveniently located right across from the world famous Airlie Beach Lagoon. Guests staying at the Downtown Airlie Motel will enjoy the friendly and warm customer service which includes a helpful tour desk, espresso bar and fashion shop in the motel complex. The holiday destination of Airlie Beach and the surrounding Whitsunday region has many different places to stay for either a long or short holiday including the ReefSide Villas WhitSundays Accommodation, Airlie Beach Holiday Accommodation, Portside Whitsunday Resort, Beach Court Holiday Villas Airlie Beach, Fantasea Reefsleep and the Pinnacles Resort & Hotels Airlie Beach. In order to book in at these or any of the other holiday accommodation in Airlie Beach then click here to make an enquiry.